or the pup, as the case may be. 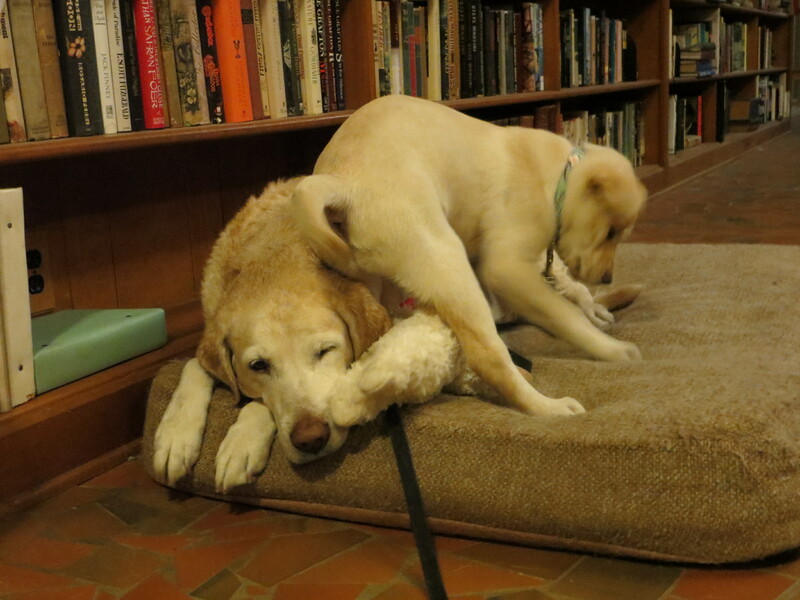 Yes, our dear Dogzilla, Electra, has gone off to college and a new pup has taken her place. It seemed to be a traumatic event for my Mom Person. She sometimes can be so emotional. But I don’t mind providing the needed comfort. We did have some good times with that crazy pup. I have to admit she was quite entertaining. For the week before they all went off to Florida there were lots of tears flowing. For that crazy pup!!! But from what I hear, Ms Electra proved to be quite the champ on the trip. My friend, Sarah, at Dr Bruton’s office had a talk with her on our last visit there. I don’t know what exactly was said, but it must have made an impression on Electra. I’m glad she didn’t make a fool of herself. So Electra is now off to the kennels with a new roommate to lay on. She’ll be getting some top notch schooling and I think that she will probably enjoy that. She always really liked school. Hooray for Electra! And Hooray for us!! And now there’s a new pup in town. Her name is Marni. My Mom Person puts a lot of stock in names. Names are important. I don’t know what Marni means. It sounds kind of like a flower to me. I seem to remember that there is a movie called Marnie. That Marnie was a liar and a thief. Hmmmm. Maybe I should find a good place to hide my tennis balls. I’ll try to keep that vision of a flower in mind. I must say that Marnie’s Mom did a better job of teaching her some manners than did Ms Electra’s. Marni is pretty flighty like Electra, but much more polite about it. She’s more of a Sparky than an Electra. So now it starts all over again. Ah me. Well, maybe now we can get back to bookish things. 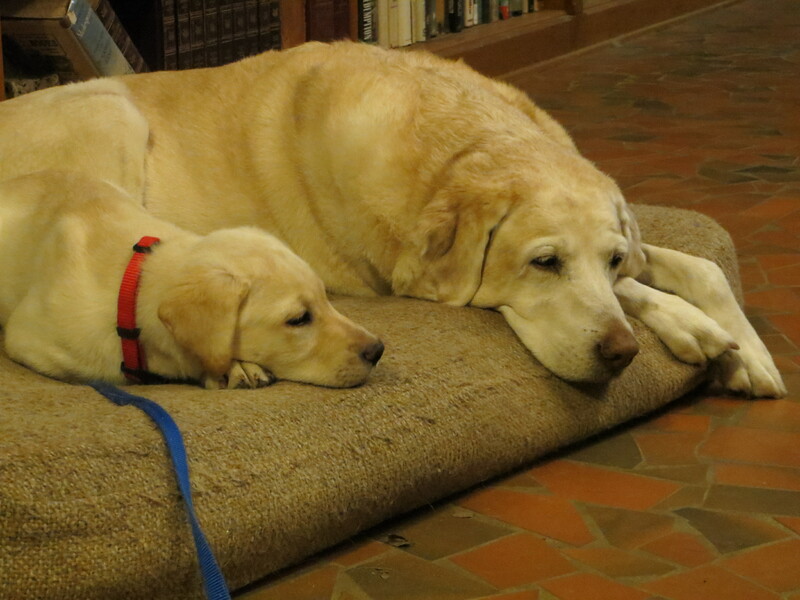 If you are at all interested in more of this tale of pups you can visit HERE. Wishing you the JOY of new adventures! 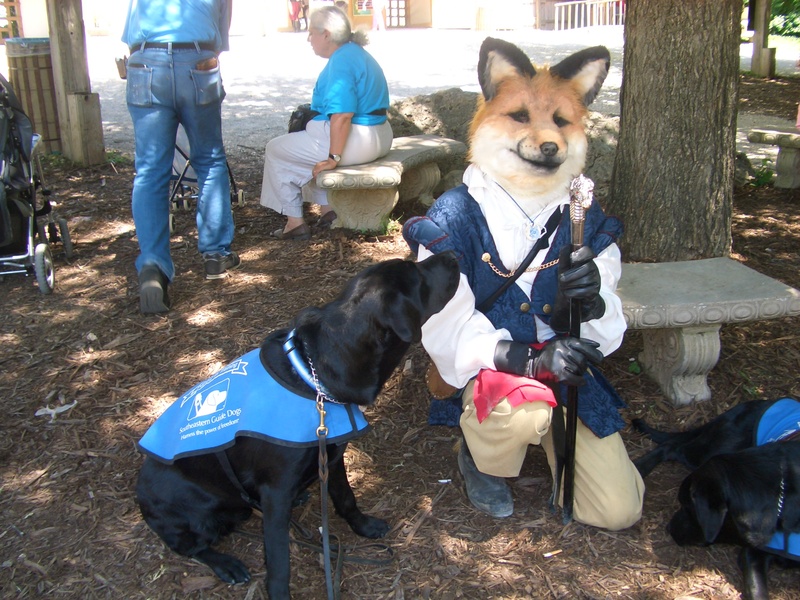 Yesterday was National Seeing Eye Dog Day. We celebrated this day by visiting a third grade classroom and educating them a bit about guide dogs. 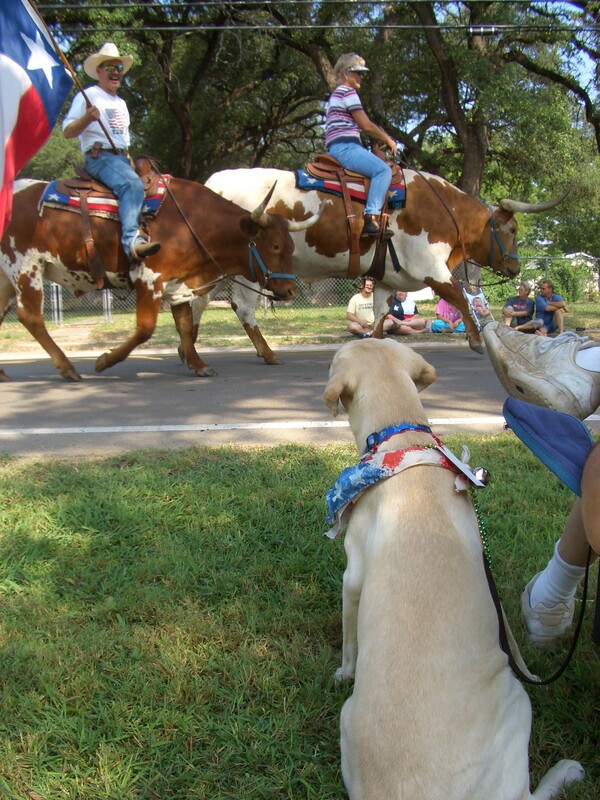 Most of the kids in Glen Rose know something about working dogs from knowing me and Walker. They all know our tales of being guide dog pups in training. All the kids who knew me as a pup have moved on to college now. I’m into another bunch of young folks altogether! New ones to educate. So we took Electra along in her official coat that says she’s a guide dog pup. We took her coat off while in the classroom so the kids could pet. No petting allowed when in coat! Just like a working dog in harness! NO PETTING! 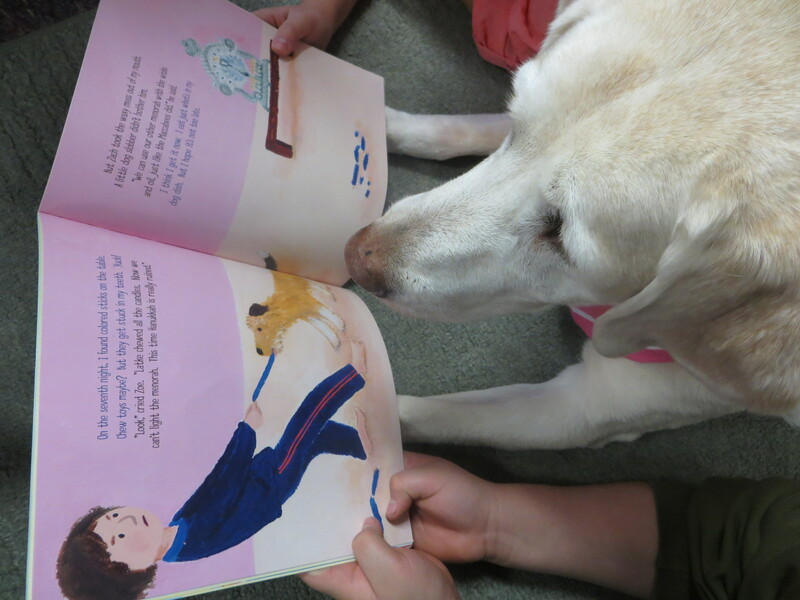 And we took a great little book about a working guide dog to help us tell our tale. This book is suitable for all ages, young and old. 3rd grade was perfect! Look at me! See the harness strapped to my back? I’m called a Seeing Eye dog. The harness is my uniform, and whenever I’m wearing it, I’m working. I guide my partner, Beth, where she needs to go. This is Hanni’s story of her job keeping Beth safe in a world full of obstacles. Traffic, crowds of people, holes in the sidewalk, garbage cans, tree branches. Whew!!! It’s a crazy world out there and a guide dog must be ever vigilant! This book presents a great picture of what it’s like to be a working dog. It’s about the job at hand, but the story is also about the relationship between Beth and Hanni. How they had to learn to trust each other because both their lives depended on that trust. How that trust was the foundation for a deep love. It’s a lovely tale. 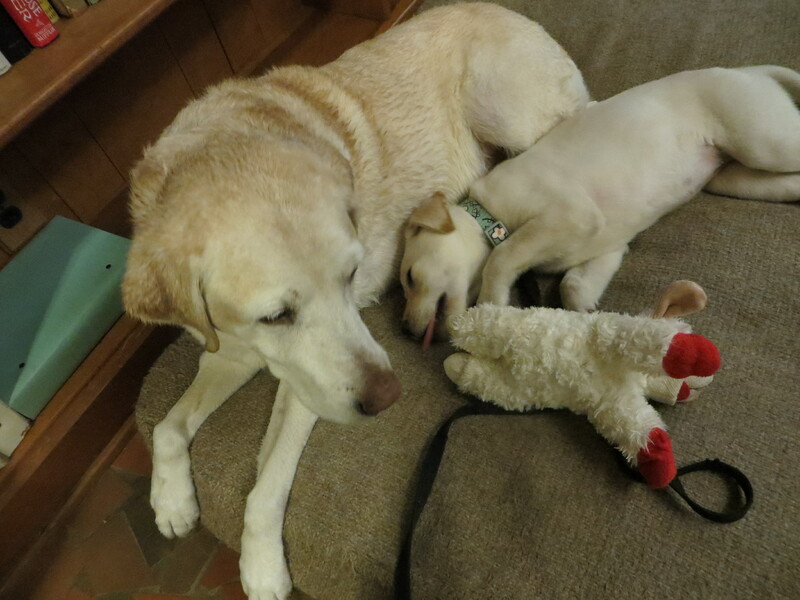 At the end of the book there are some factual notes from Hanni about her life from pup to working guide dog. And some notes from Beth about how she became blind from juvenile diabetes and what life is like as a blind person. There is also a list of references for further reading. This book is also available in Braille. To learn more about Braille visit this website HERE. You might learn how to write your name in Braille! The Learning to Give website has some good ideas for ways to use this book in a classroom. You can visit them HERE. We had a great discussion in our classroom about how working dogs help their handlers. What senses the dogs use to do their job. You could let kids pretend they were blind and try to maneuver around the classroom. And then let someone else be their guide dog. If there is a guide dog school near you, you might pay them a visit. Maybe even volunteer! Southeastern Guide Dogs has puppy hugging days. 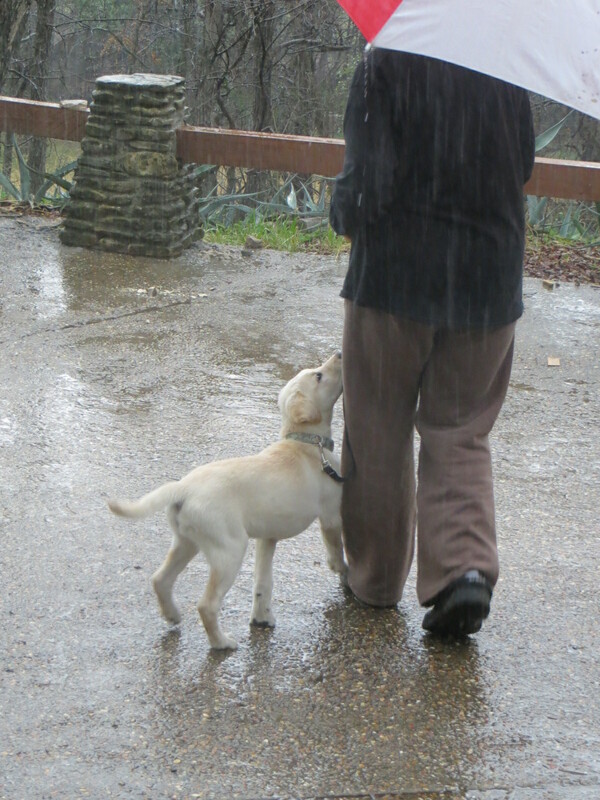 And volunteers come in to walk the dogs that are in training. You can find a list of guide dog schools HERE. This is the website for the National Federation for the Blind. You can find out more about blindness there as well. For more about juvenile diabetes visit HERE. This is PERFECT PICTURE BOOK FRIDAY. 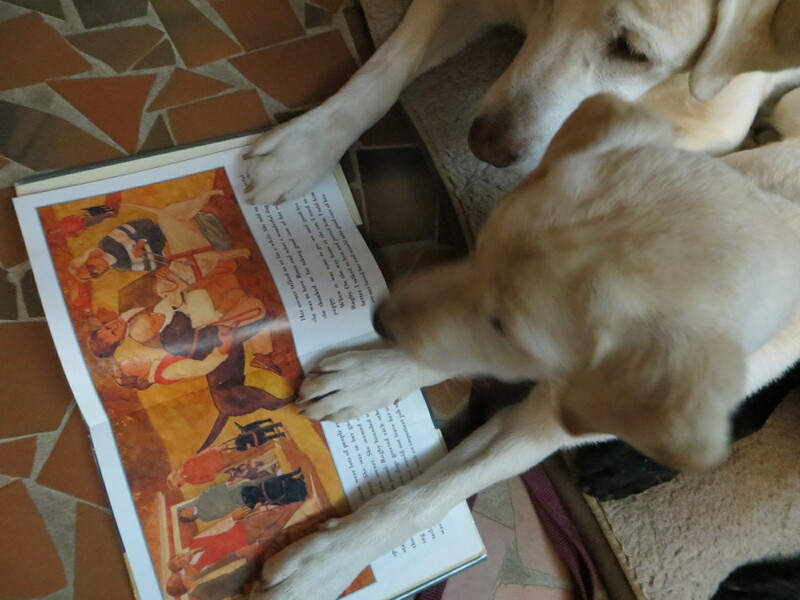 For a list of more Perfect Picture Books visit Ms Susanna Hill’s blog – you’ll be glad you did!! Have a Safe and Sound weekend!!! I’m a pretty lucky dog. I have a nice home and a lovable family that I live with. I have several nice, comfy beds and lots of toys to choose from. I get fed pretty regularly with plenty of snacks to go along with meals. I have a fine job where I get to visit with lots of great folks. Life is pretty good, I’d say. I hear that some dogs are not so lucky. Some dogs don’t have nice homes and families. I’ve never come across one of these dogs, but I hear the stories. One of the books I received in the mail recently is about a lucky dog who didn’t have a home, but then found one!! This book was sent to me from Ms Sue Heavenrich. You might want to visit her at her blog home HERE. It’s a pretty nice place to visit! Latke is a shelter dog, which means he lives in a kennel with lots of other dogs – all waiting for someone to come visit and decide that “THIS pup is the one for ME”!!! For Latke, that day came in December when a family walked in looking for a present for Hanukkah. I don’t know anything about Hanukkah. It’s a holiday celebrated by Jewish people. But according to this book, it is “an eight-day Festival of Lights that celebrates the victory of the Maccabees over the mighty armies of the Syrian King Antiochus.” That’s a lot of history for another day, I think. Anyway, this family wanted to celebrate by getting a dog for their home. And a medium-sized, brown dog was just what they were looking for. They named him Latke because he was the color of a fried latke. And what is a latke I ask?! a latke is a fried potato pancake! Yummmmmmm! So, little brown Latke goes home with his new family. But now he has to learn all the rules of his new home! It’s very hard and he makes lots of mistakes. And gets into quite a bit of trouble. But LUCKY for him, he has been chosen by a forgiving and patient family. He begins to learn the rules and finds that having a home and a family is GREAT! He really is a LUCKY dog!! This was a cute, informative tale. We learned about some Jewish history and traditions. We talked about shelter dogs. 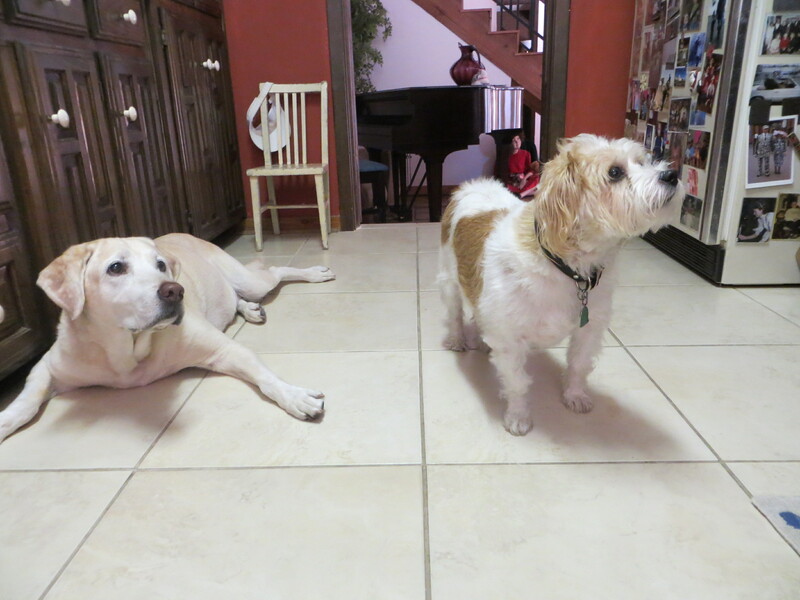 Some of my readers have dogs who came from shelters. We talked about house rules and dog training and caring for dogs. Wow! Lots of talk generated by this little book!!! Thanks Ms Heavenrich for your generous heart! I hope you find some luck in your days this week! We are all about guide dogs here at the 7 Acre Wood. And goats. And grapes. And swimming. And tennis balls. But I digress. I want to talk about guide dogs today. My family here has raised guide dog pups off and on for a good number of years. The very first one was a black Lab named Gretta. During her long, illustrious life she actually achieved Sainthood. 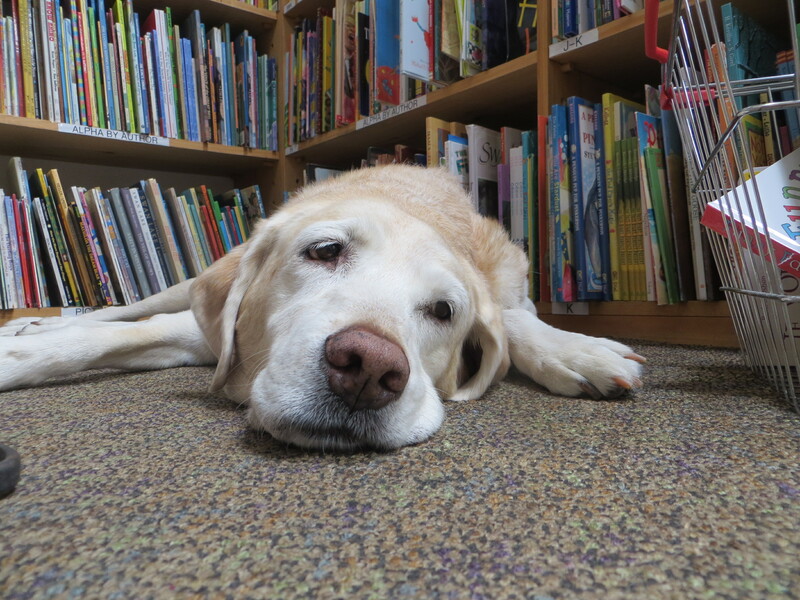 St Gretta came from a guide dog school in California called Guide Dogs For the Blind. All the other pups that have passed through our gates have come from a guide dog school in Florida called Southeastern Guide Dogs. Including myself. There have been others in between. Some have made the humans proud and become working guide dogs. Some have made the humans proud and been extraordinary therapy dogs. 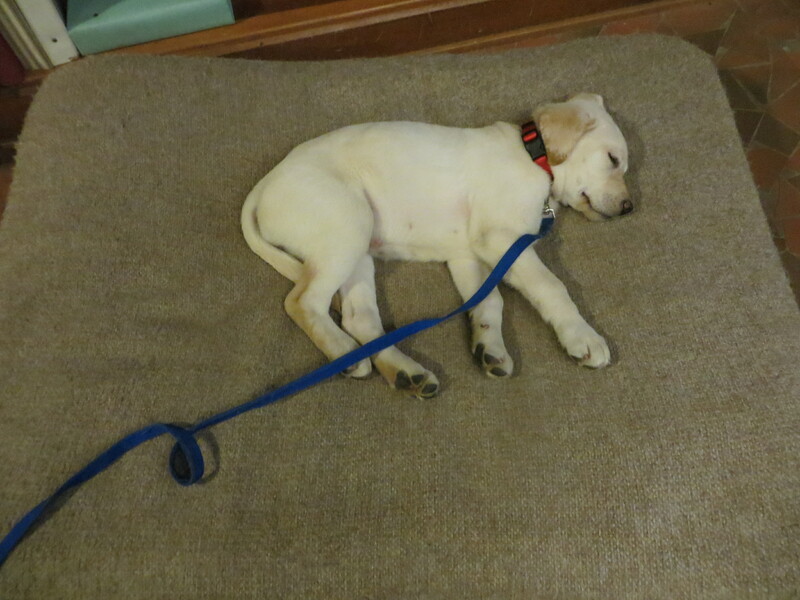 The life of a guide dog puppy in training is an emotional ride – for the humans and for the pups. There is a real bond that develops and lots of love is invested and then the pup has to move on to other things. The humans have to let go. The pup has to let go. And both have to create new bonds and new attachments. Some dogs just can’t do it. I couldn’t and came back to live where I knew I belonged. Only about half of the pups that return to school actually go on to become working guide dogs. 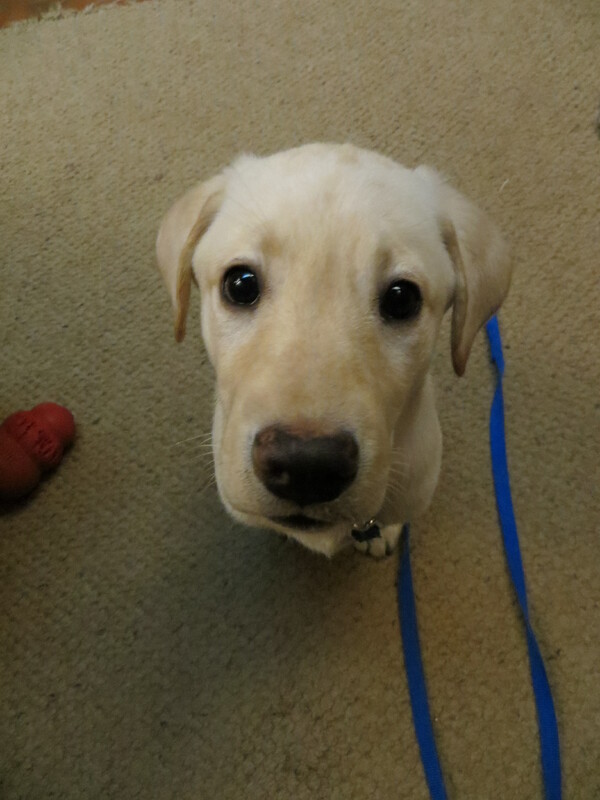 Statistics show that a higher percentage of Labs become working guide dogs than any other breed. 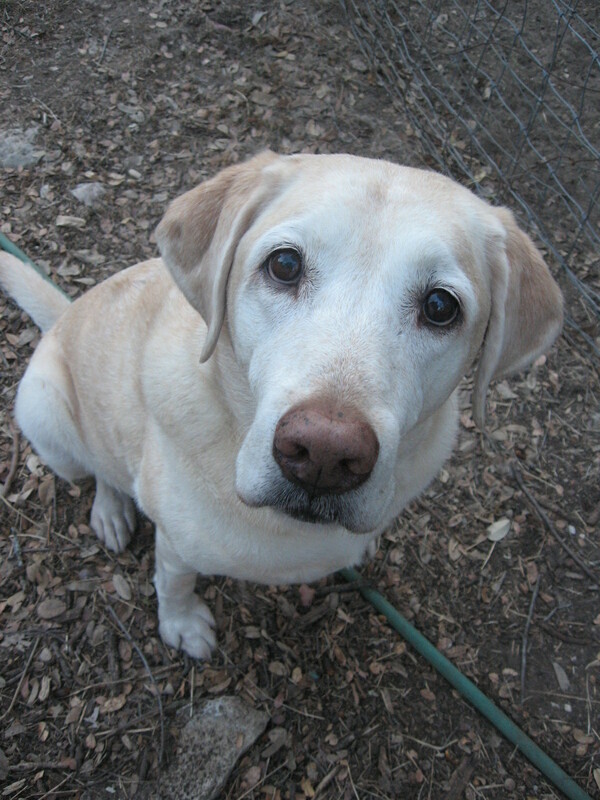 I think that that may be because we Labs are basically happy with anyone who feeds us on a regular basis. Anyway, I have a Perfect Picture Book for you that’s about a year with a guide dog pup. Rugby is my dog. He is a chocolate Labrador, and we have had him for as long as I can remember. We used to do everything together – just the two of us. 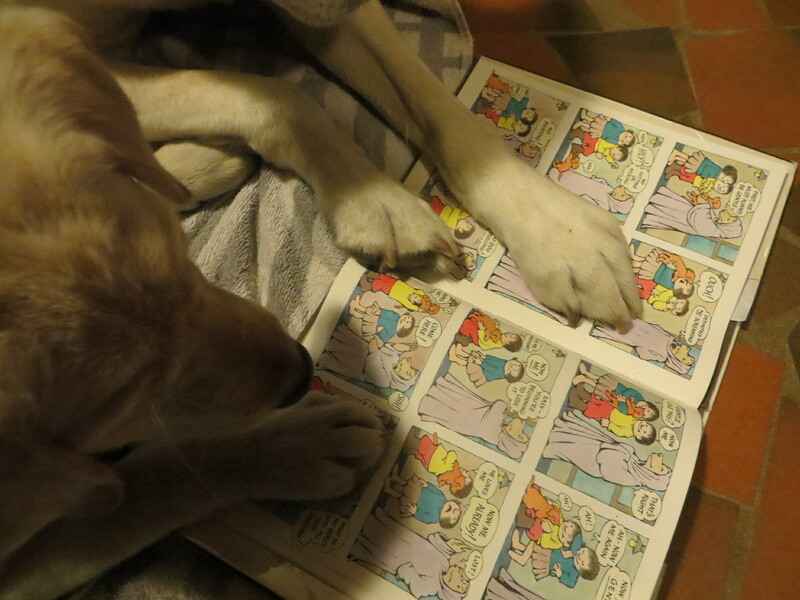 The narrator of the story is a young boy who has a really close friendship with his dog, Rugby. One day his dad comes home with a little yellow pup named Rosie. Rosie was a guide dog pup and would only live with the family for one year. The boy knew all about this, but didn’t know how to tell Rugby. Rugby was not happy about the new pup. She tried to get him to play, but the wasn’t interested. It took him quite a while to decide that she wasn’t going anywhere and he might as well make friends. After that the two dogs were always together, romping and playing and napping. Rosie needed a lot of extra training out in public where Rugby didn’t get to go. But he was always waiting when they returned home. 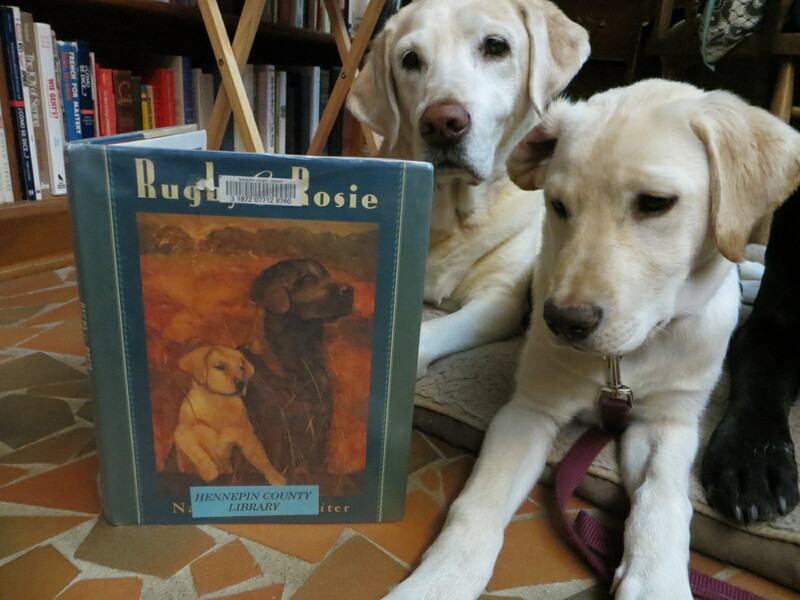 Then the day came that Rosie had to return to the guide dog school. Everyone was sad. Even Rugby. Rosie became a guide dog and the family, along with Rugby, got to go to the graduation ceremony and see Rosie again and meet her new person. They saw that Rosie was happy and making a difference in the life of this new person. All because of their love and devotion. They were all very proud of her. This book makes my Mom Person cry every time she reads it. It’s a well done story. You can see and feel all the emotions tugging at everyone. Even the dogs. When we read this book to kids, there is always a discussion about letting go. Life is full of letting go. Even if you’re a little person growing up. There are 13 accredited guide dog schools in the United States. 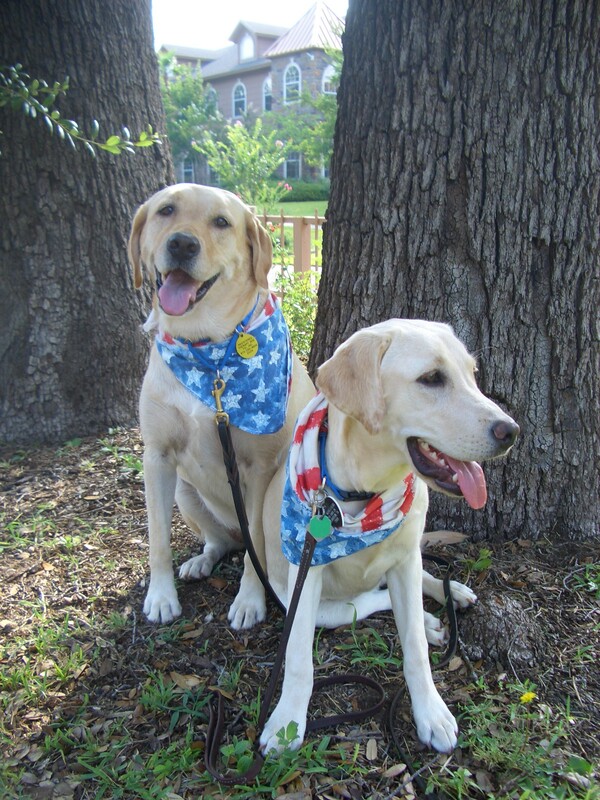 For information about all of them visit the Guide Dog Users, Inc. website. If there is a school near you, you might want to go for a visit. I know that Southeastern has puppy hugging days when they let people come play with all the pups. 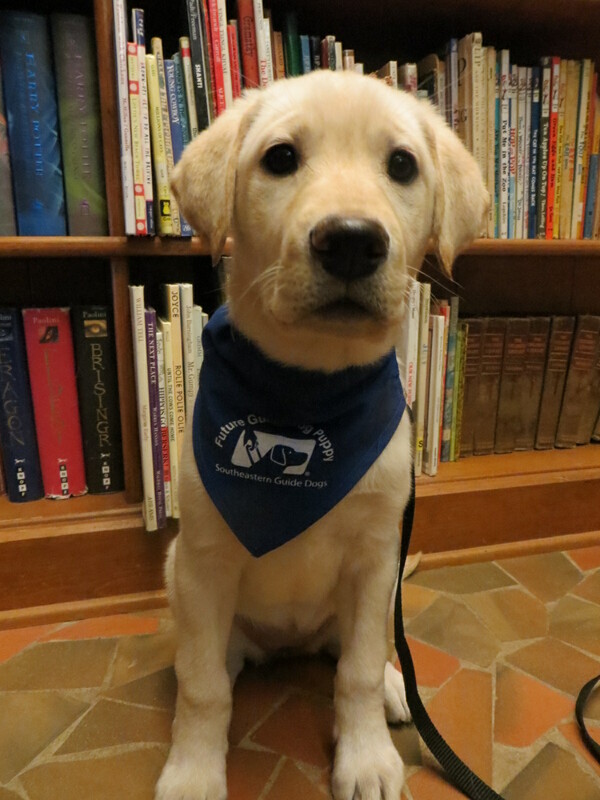 You can visit their website and find out all about pups and being a volunteer puppy raiser. 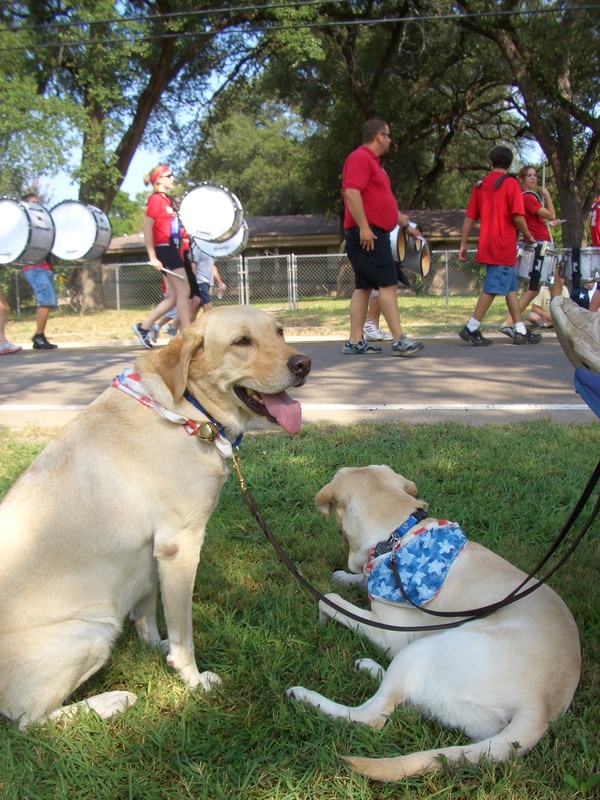 HERE is a link to some thoughts on etiquette when encountering a guide dog team. HERE is an article for kids about blindness. You could have a discussion about being blind. Put on blindfolds and take a Listening Walk around the room. Think about how you would be using all your other senses if you couldn’t see. And now you might want to venture over to Susanna Hill’s blog to see a whole big list of Perfect Picture Books and resources to go with! — Enjoy!! Saturday was a Good, Good Day here at the 7 Acre Wood! The rains came!!! Not a whole bunch of rain, but rain nonetheless. Enough to perk up the bluebonnets and make the river bubble with JOY! The rain also provided a training opportunity for Little Miss Electra. She came here from Florida so I’m sure she’s seen lots of rain, but I don’t know about umbrellas and thunder. She was not bothered by any of it. We all had a nice rain walk. As I said, this was a Double Good Day — The mail lady came to our house and delivered TWO, yes, TWO surprise packages for ME! I love that mail lady! One of the packages was from our friend Kay. It was actually for all of us Pups to welcome the “new addition” to the family. TWO bags of yummy treats!!!! From the Canine Cookie Company in McKinney, Texas. One bag had tiny treats for Electra and the other had nice big treats shaped like squirrels! All chicken flavored! MMMMMMM! They sure know how to make some GOOD snacks in McKinney!! There was also a bear for Electra. Walker thinks it was meant for him. The second package came from the Mom Person’s friend Rhonda. It was a new book! A new book of my Hero, Momo. 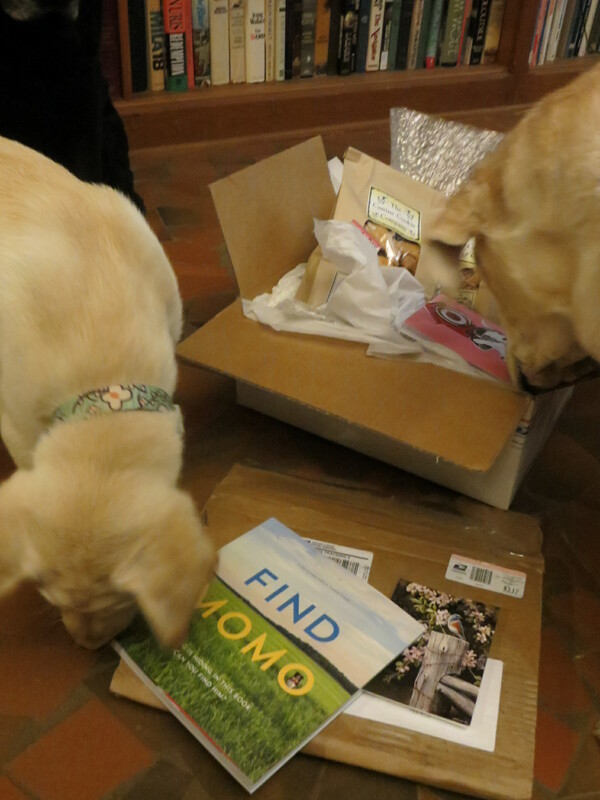 The book is called Find Momo. Momo is a border collie who likes to hide. We follow Momo on Facebook where he posts pictures every day of good hiding places. He is a GOOD hider. And I am a GOOD finder! I’ll tell you more about this awesome book after I’ve had a chance to peruse it and find him. And if you’re looking for a relaxing vacation spot you might check out Rhonda’s inn in Arkansas – Mountain Thyme Bed & Breakfast. I understand that she is a very GOOD cook! And some more GOOD cooks are found at the Canine Cookie Company! You can visit their website HERE and order some of those GOOD snacks for yourself! I hope you had as fine a weekend as I had! 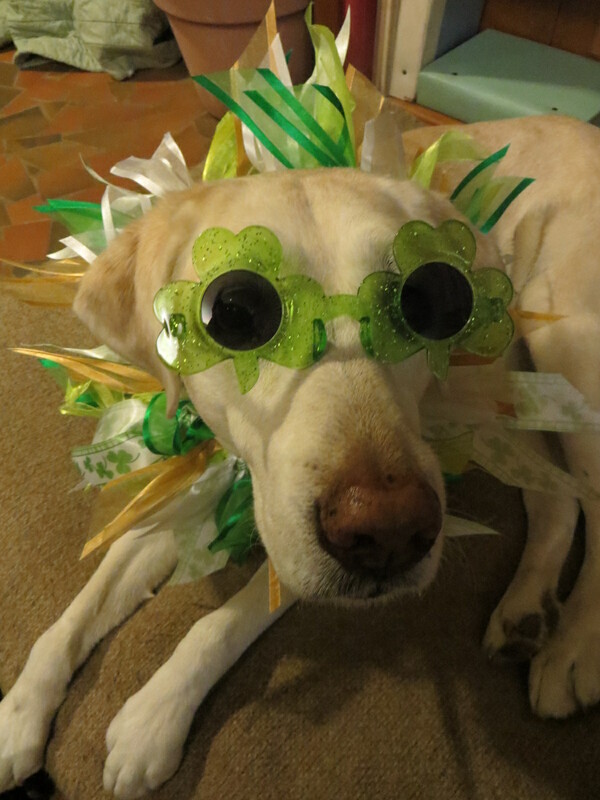 Now I will wish you a Happy St. Patrick’s Day! May your day be filled with rainbows! Training a puppy is not an easy task! Ms Electra is a Mini-Godzilla! Chewing and eating everything in her path! What’s a good dog to do?! The Mom Person to the rescue! She pulled a book off of our shelf that is a story about puppy training. And written by none other than Mr Maurice Sendak and his dog training buddy, Mr Matthew Margolis. 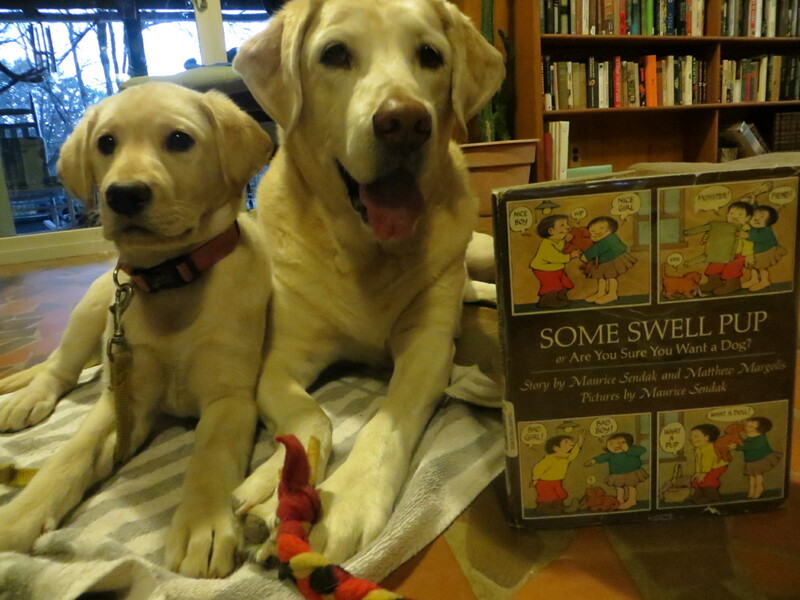 The book is titled SOME SWELL PUP or Are You Sure You Want a Dog? I think that this would be considered a graphic novel. It’s done in comic book style. It begins with a brother and sister pining for a dog of their own. And then a pup is left on their doorstep. They are thrilled! Until the puppy proves to be a Mini-Godzilla! Chewing and eating everything in its path! They get angry at the pup and decide it needs to go off to school. The pup is soon returned to them with a note saying the pup is too young to train and the school is now a wreck! What are two kids supposed to do now?! Well, a stranger comes along and tries to show them that what the pup needs is lots of love. That everything it has been doing is normal puppy stuff. The kids continue to argue with each other (as siblings are wont to do) but soon realize that talking kindly and showing love to the pup is the right thing to do. The sub-heading of this book “Are You Sure You Want a Dog?” is a fitting one. This is a tale of a Godzilla pup. But it is a realistic view of what it is like to have a puppy in the house. It is a BIG responsibility! They chew things, they pee and poop, they jump, they whine and bark. Having a new puppy is not just fun and games! This is not really a “training book.” It is a Maurice Sendak take on a training book. It is a very old book and hence has very old ideas. One thing that is a bit befuddling is that it asserts that the pup is too young to train and you should wait until a pup is 12 weeks old. That’s just crazy!! Training needs to start at day ONE!!! The sooner the better. 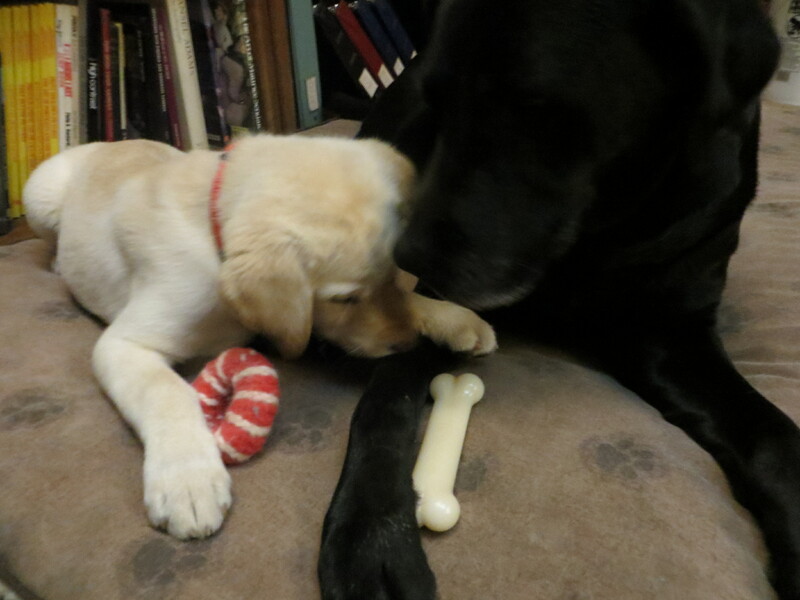 The book does show that shouting and hitting and ignoring are NOT the ways to deal with a young pup. A pup needs lots of love and understanding. And that’s the main thing about pup training. Love and patience and understanding. The story could also be seen as a story about getting along with other PEOPLE in the big world. The book is actually a good lesson in how to treat ANYBODY. Not just pups. Be kind and gentle. Always. Show some love and it will be returned to you. A BIG lesson to learn! I am trying to be patient and understanding with my Godzilla pup. It’s not always easy. But I can already see some improvement in her understanding of household rules. She is learning to be more polite. It’s not easy for her either. She is just a pup after all. There are some good pup training books out there for kids. Martha Stewart has instructions for making some cute origami animals from napkins. 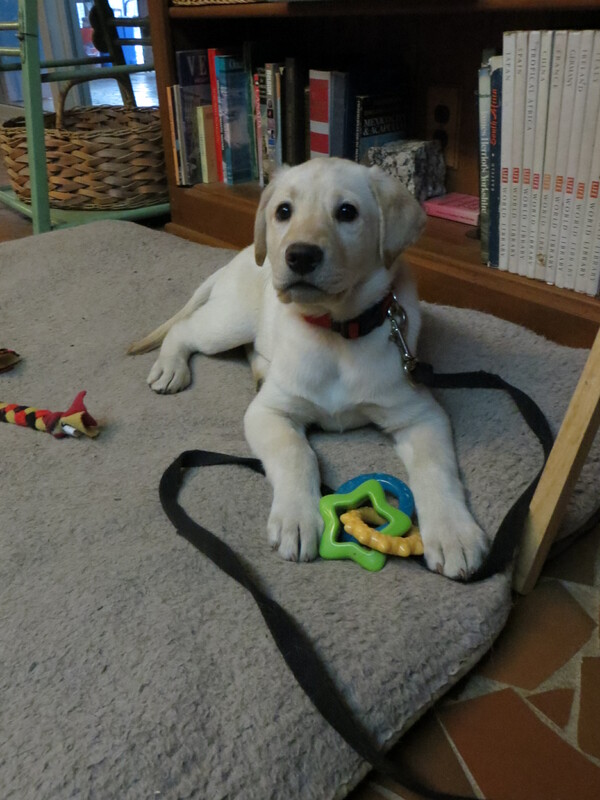 Southeastern Guide Dogs likes to get donations of DIY paracord puppy collars. They provide instructions HERE. 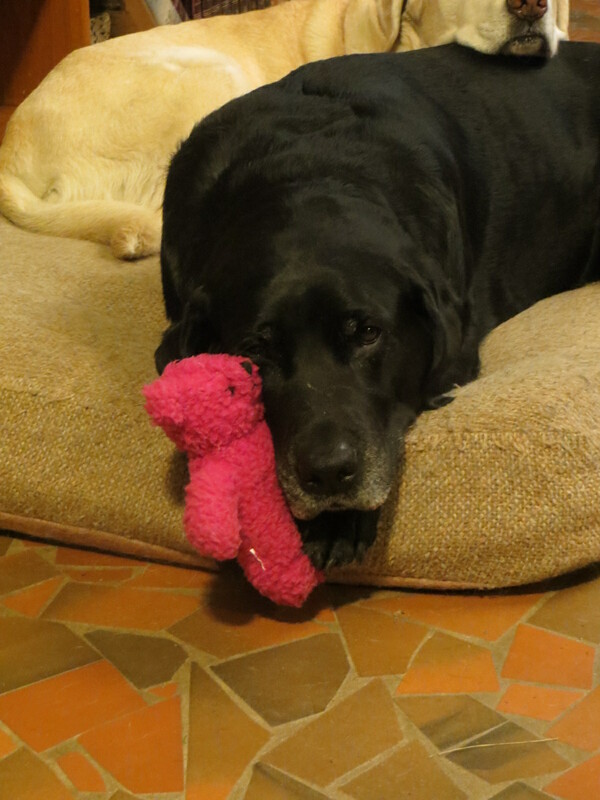 HERE are instructions for making a great fleece tug toy for your dog. 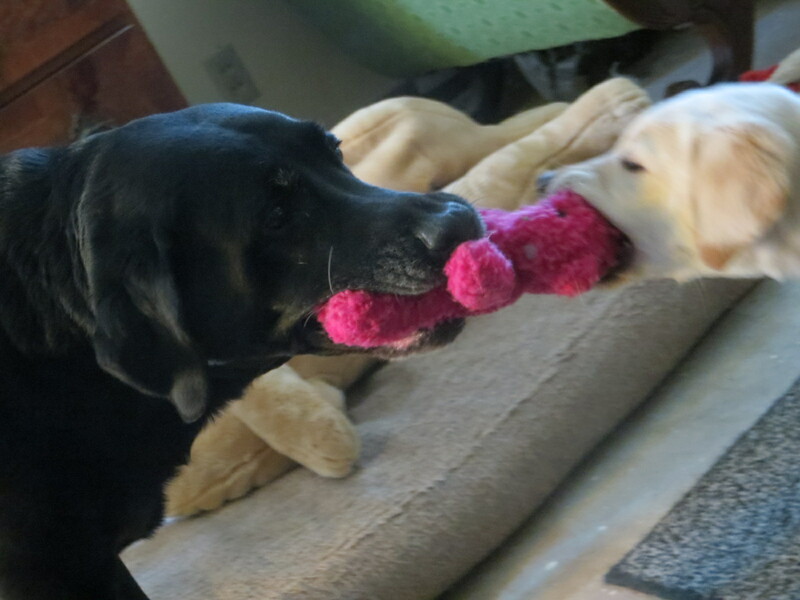 We LOVE these toys! And our detention boys sometimes make a bunch of these to give to the local animal shelter. Now you might want to visit Susanna Hill’s Blog for a list of more PERFECT PICTURE BOOKS and fine resources to go with! And here is a little training video with a 5 week old pup! I wish you success and love in all your endeavors! A New Job For Me! 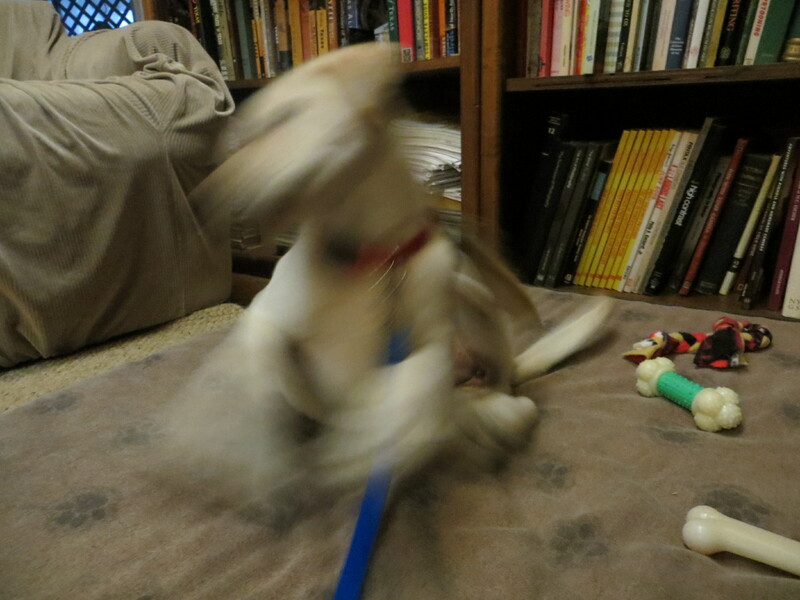 Just a blur whizzing by, chomping as she goes. I was actually a teacher before. I taught Walker the ropes. But I thought that I was retired. I hear the Mom Person saying that a lot. I must admit that she has been talking about this Guide Dog Pup for some time. I guess I just didn’t think she was serious. But here it is. And here to stay for a year! A year! I don’t know much about time, but I think that that is forever. I will have an assistant. Walker has been dragged in for back-up. He’s not totally sure what he’s getting into. 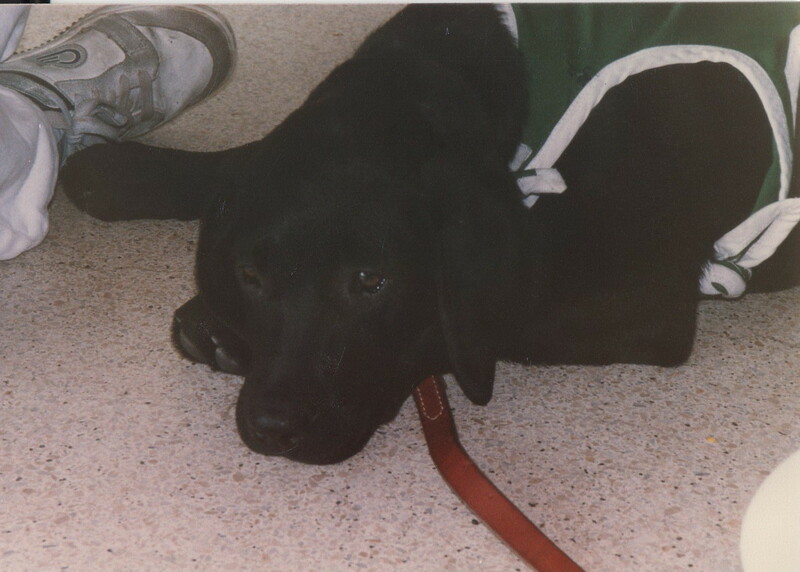 I was a guide dog pup once upon a time. Just like little Electra is. I have to remember that. Remember how hard it was to be so little and have to act so big. I had a great teacher. Hank was the essence of patience. The Zen master. I will try to be like Hank and as always, will do my best to whip this youngster into shape. There may be hope for Electra. She is a smart little thing. I’ve already taught her to sit politely for a treat. And the good thing here is that with her training, she’s getting lots of treats – which means more treats for me, as well, for being a good teacher!! No book today. Who has time for reading?! My goal, though, is to teach this young one the Zen Power of sitting quietly and listening to a good book. 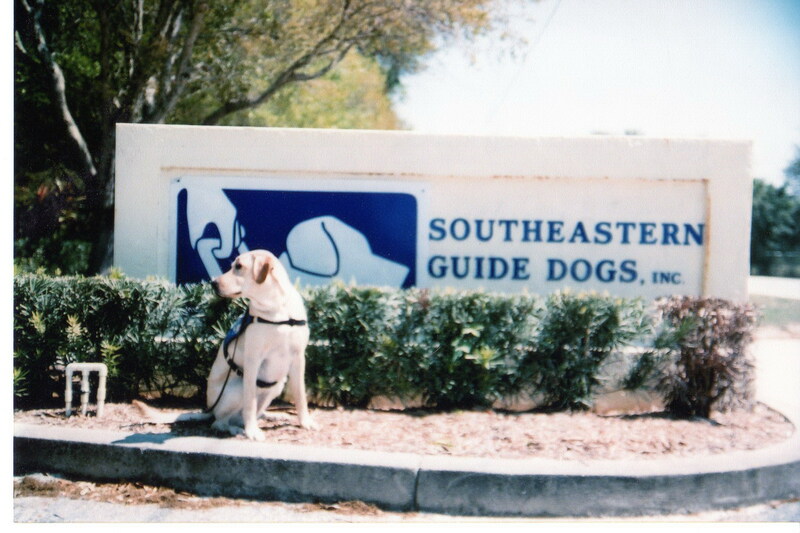 If you would like to find out more about Southeastern Guide Dogs, you can check out my page at the top of this page. Or you can visit their website HERE. And you can get a puppy fix by visiting their puppy cam HERE. I wish you a good night’s sleep and sweet dreams! We just found out last night that today, August 26, is National Dog Day!! I don’t know exactly what that means – the Mom Person says that around here every day is Dog Day. And that may be true. 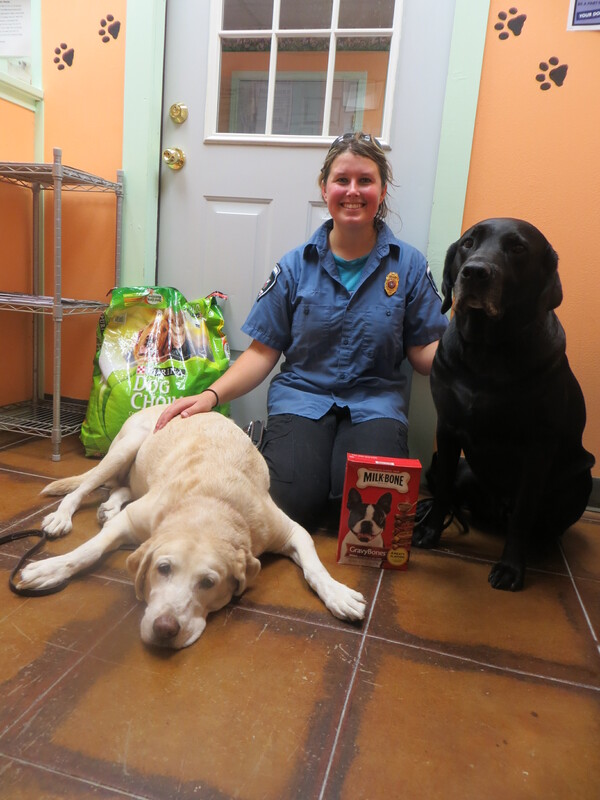 But we decided to celebrate by taking a bag of dog food and some treats to our local animal shelter. Kathryn and Tammie do a great job at the Glen Rose Animal Shelter. They’re very good at finding homes for homeless dogs and cats. They like their job!! 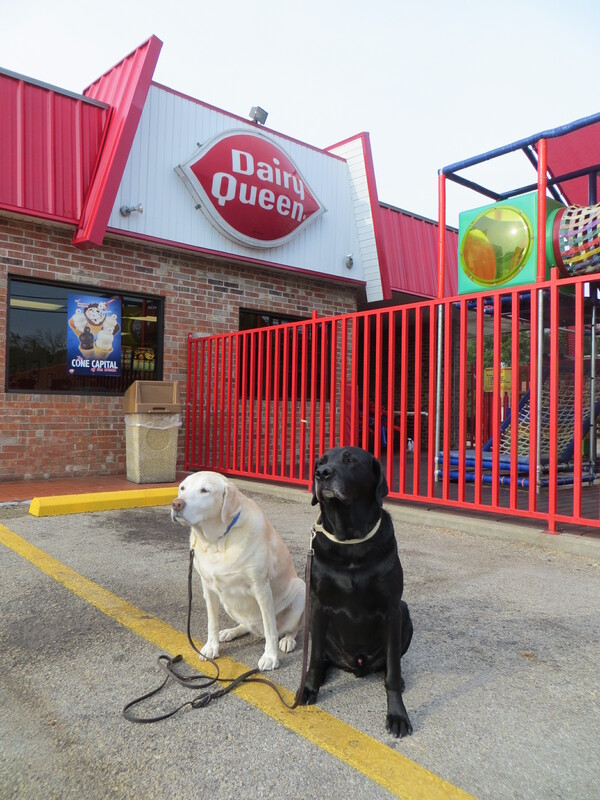 We also got to go to Dairy Queen and get some Fries!!! We are truly lucky dogs!! When we got home, the Mom Person got out a bag full of balls! We got to play catch and Hide and Seek and all those fun ball games. Whew! What a day it has been! 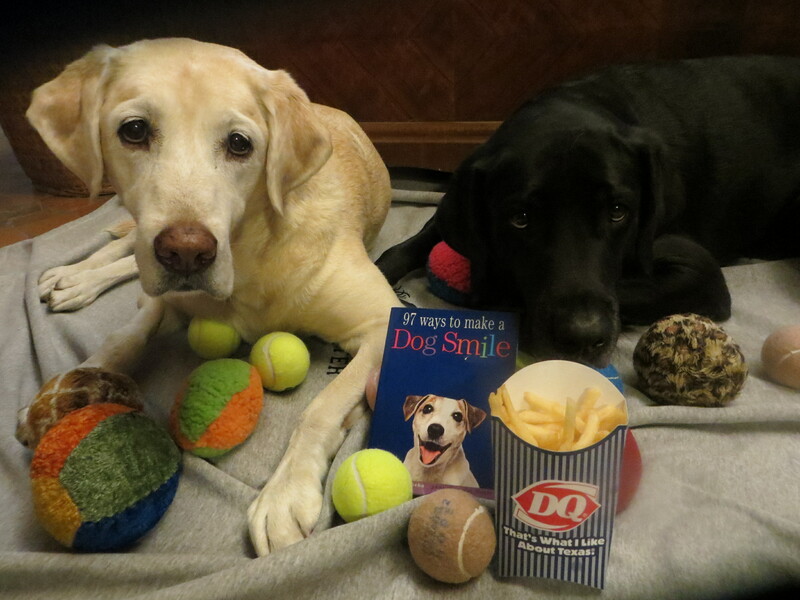 We have a book called 97 Ways to Make a Dog Smile. 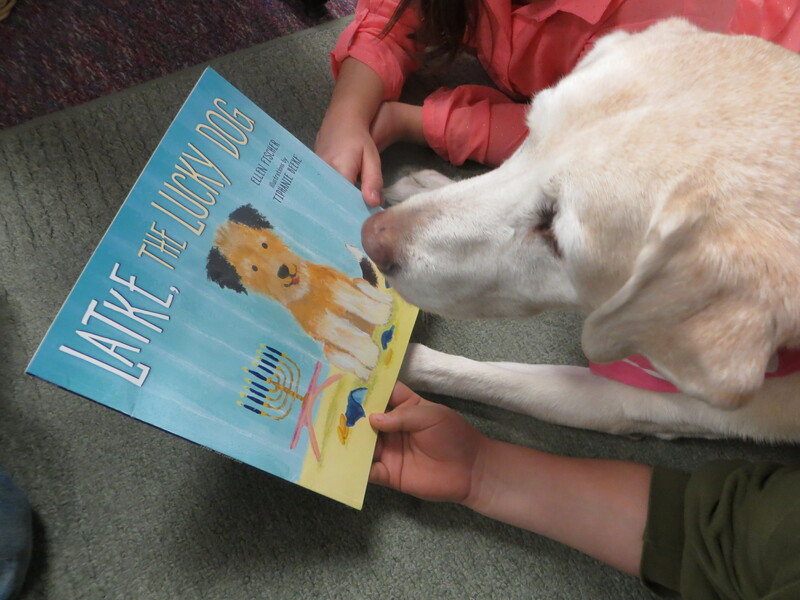 It’s a great book with some great ideas to make your dog happy. Like # 1 – Ear Noogies! What dog doesn’t like that?! 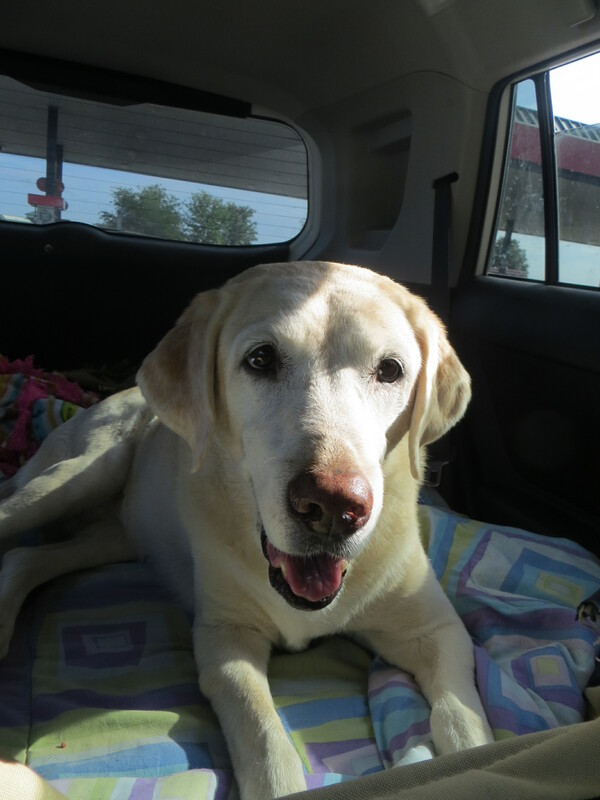 And #23 – Joyride in the car! #59 – Bobbing for treats in a pool or bucket! And my favorite – #9 – the Full Body Massage. Yessiree! This book was written by Jenny Langbehn with photos by Pat Doyle. It was published in 2003 by Workman Publishing. We’ve had a good Dog Day. 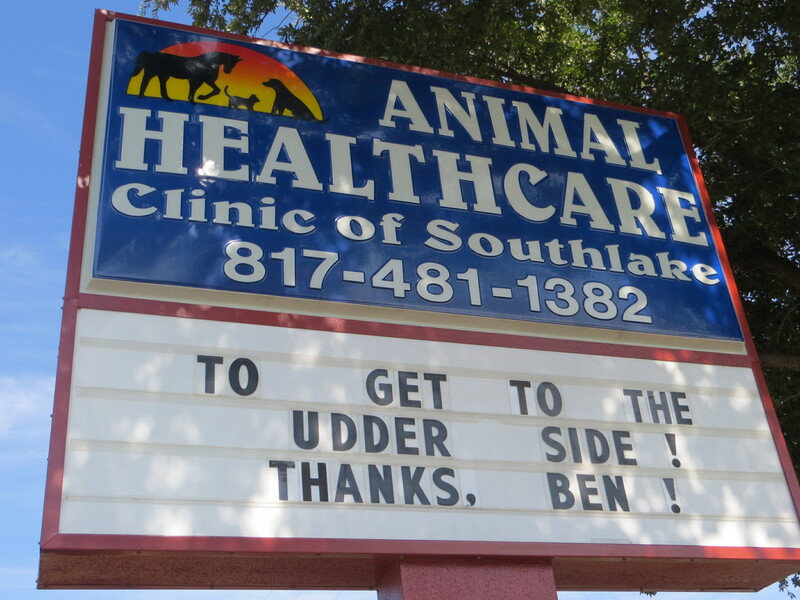 I hope your dog has. Go out and PLAY! 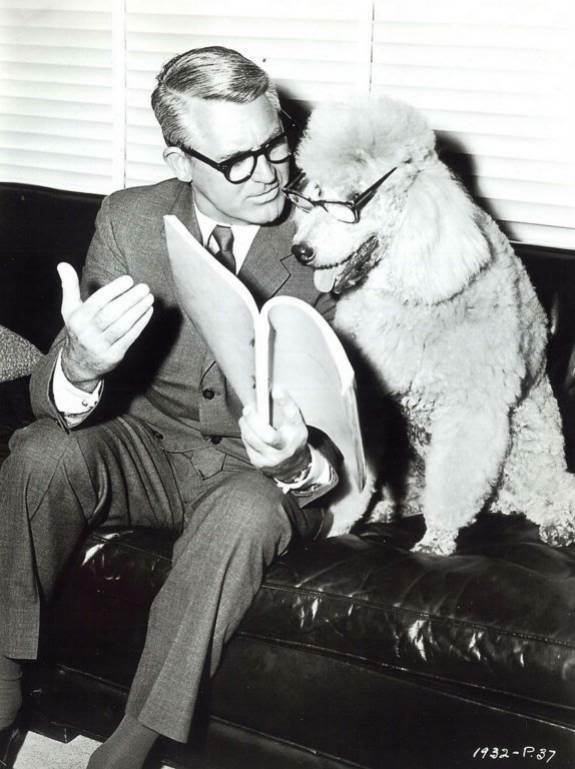 For more info about National Dog Day you can check out the official website here. Go have fun with your dog!!!! A Big Day in Big D! As Willie Nelson once sang — We’re on the road again! Our monthly road trip to visit my magical acupuncturist, Dr Bruton. It’s a long drive to his office, but well worth it. I usually take a nap, but sometimes I watch the world go by. In the busy mornings, though it’s mostly cars and big trucks. People in a hurry. Boring. The Mom Person keeps the music going and sometimes we sing along with James Taylor. Here’s the sign out in front of Dr Bruton’s office. 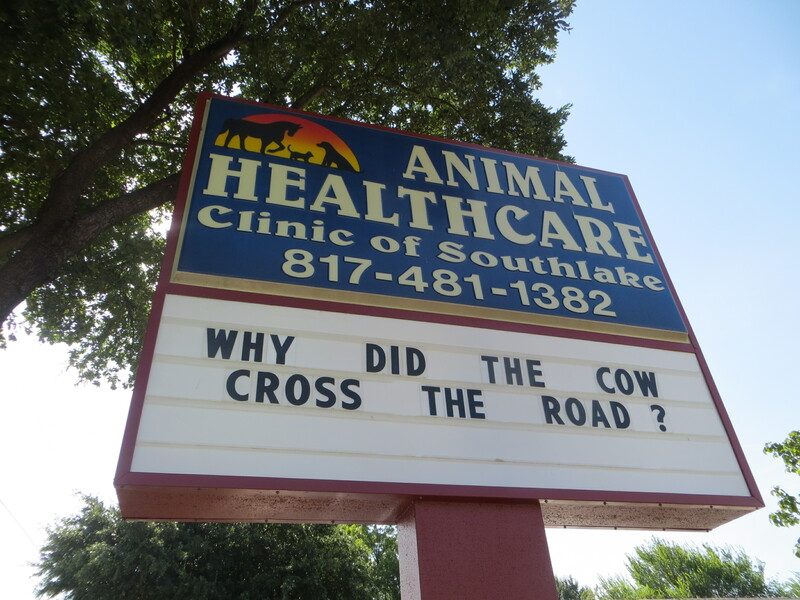 I’ll give you the answer later. I got the needles this trip. And when all was over and done with, I felt like dancing!! And after we left, guess what I got? Yes, indeedy! 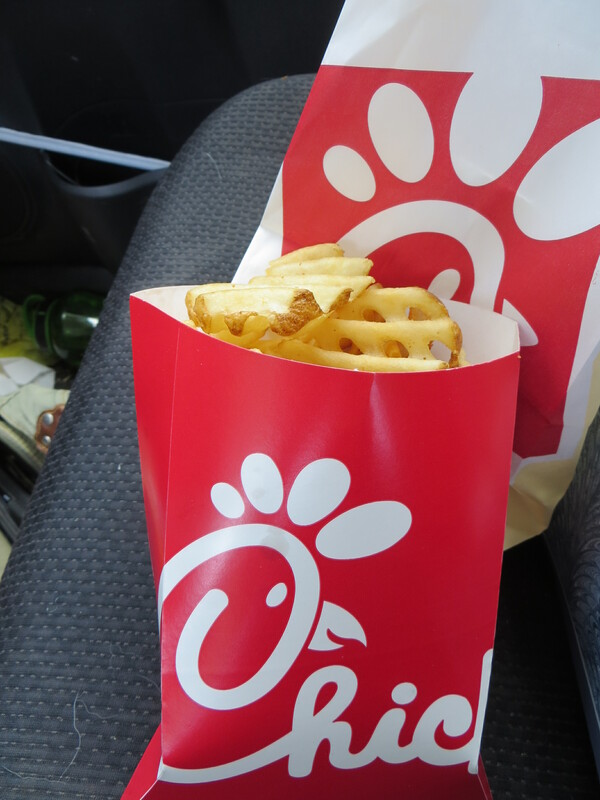 Chick-fil-A Fries!!! UMMMMMMMMM UMMMMMM! 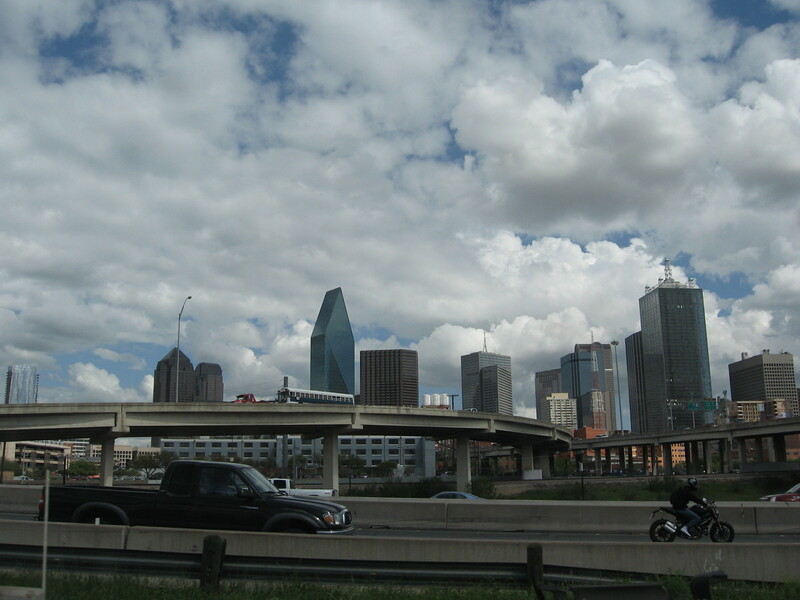 Next stop – a visit to see my Nanny who lives down the road apiece — in Big D, Dallas! 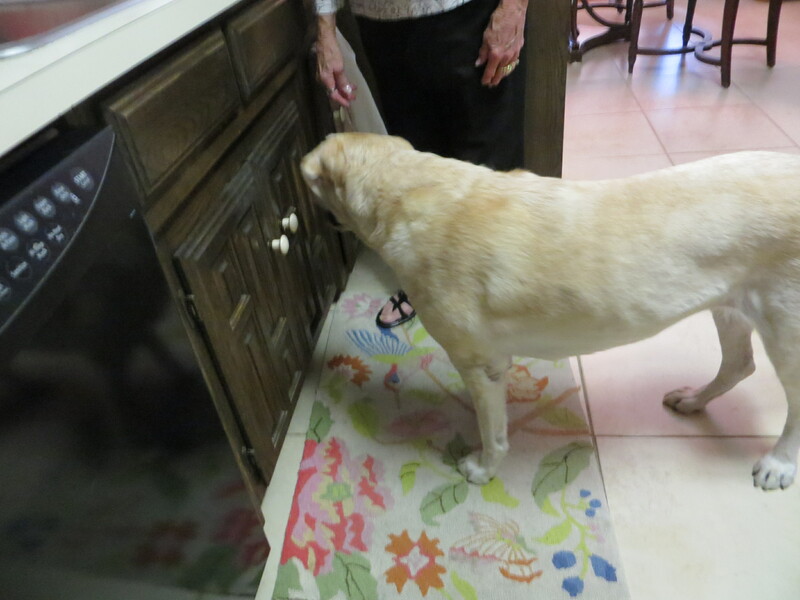 Guess what Nanny keeps in this cupboard? Yes, indeedy! 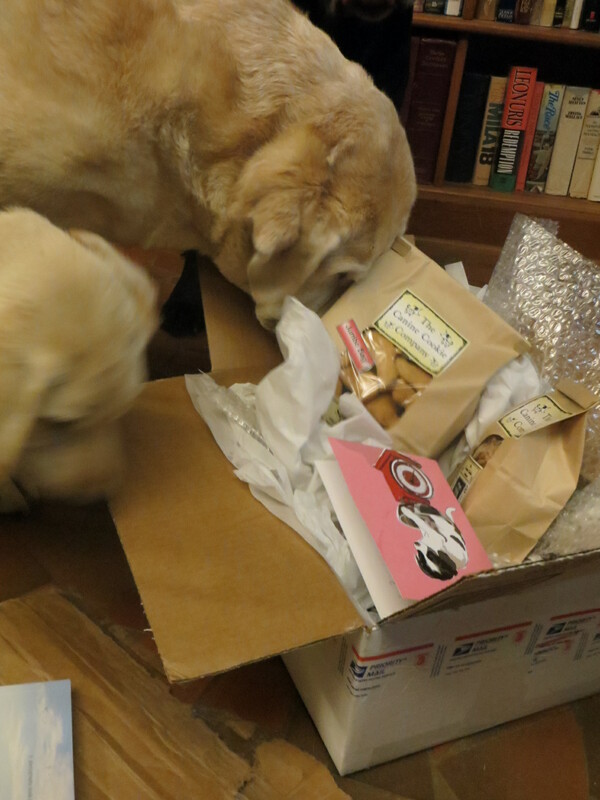 Dogtreats! She is the best Nanny ever! We hung around Nanny’s for awhile and I got to play some ball and visit with my little buddy, Charlie. 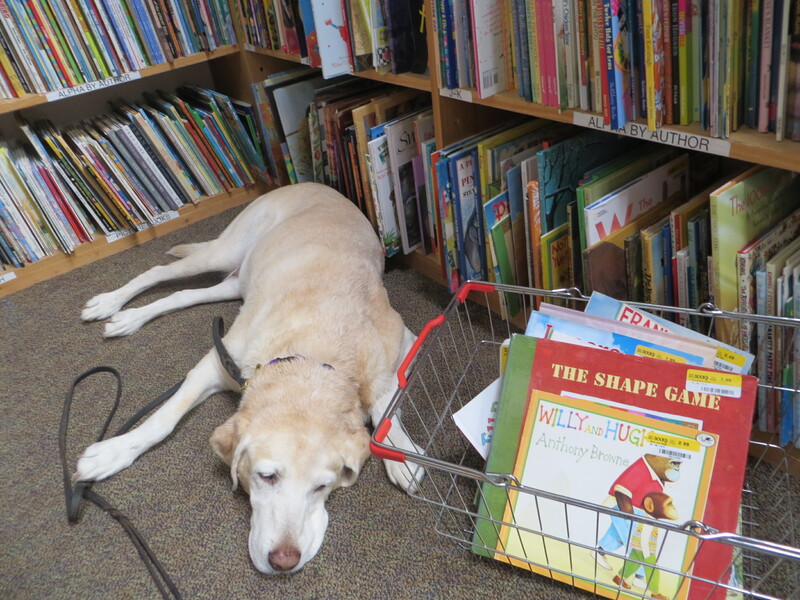 After a nice visit there, we moved on to my Mom Person’s favorite shopping experience – Half Price Books. This is a humongous big ole book store that allows people to bring their pets shopping with them! I don’t often see other pets when we go, but occasionally I do. Mostly dogs, but once a giant lizard on a guy’s shoulder! And once a flying squirrel in a guys pocket! It’s a good thing my buddy Cisco wasn’t with us then because he would’ve gone crazy! Anyway, we spent a LONG time here. The Mom Person ALWAYS spends a long time here, but today she had to find books for birthdays and babies. We got a few books for ourselves as well. I’ll be telling you about them some other day. 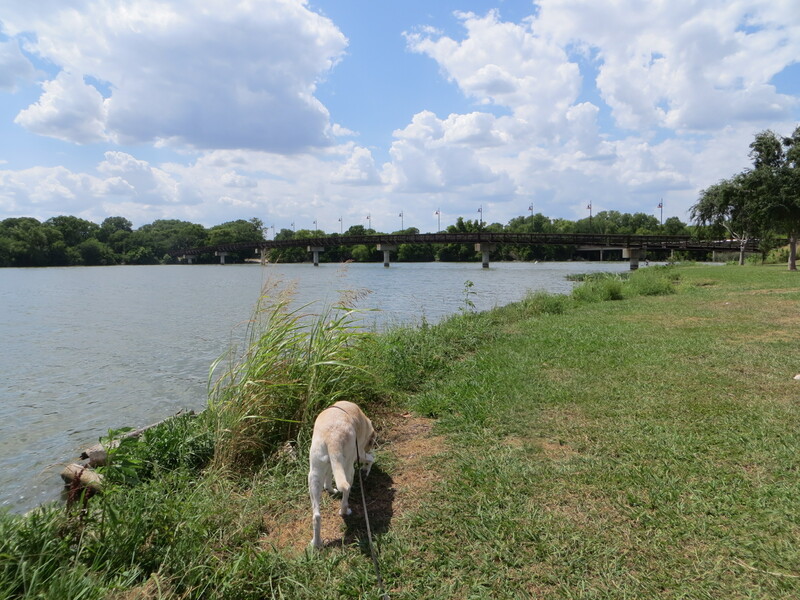 From the book store, we traveled on to White Rock Lake. A lovely spot right in the middle of Dallas. Many years ago, for a short while, we lived by this lake and I got to spend a lot of time getting to know the ducks that live there. 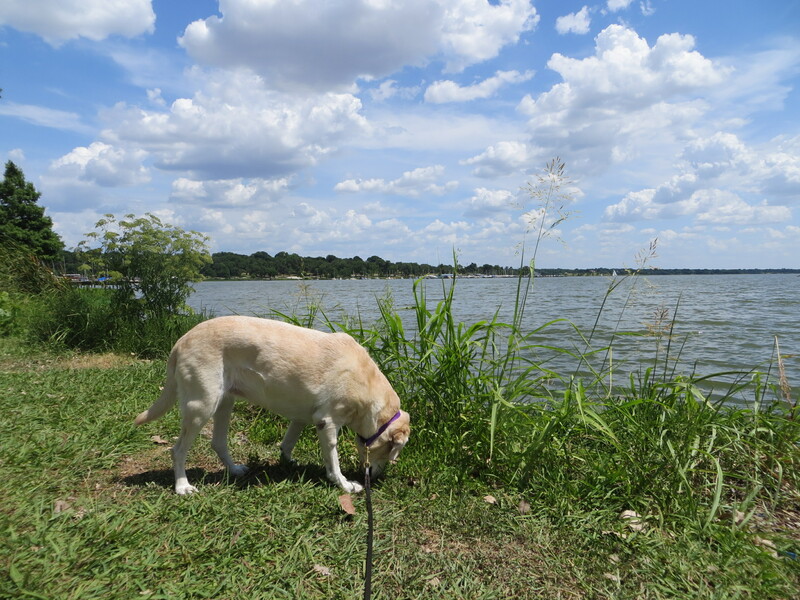 Today, I was just excited to get out and follow the scent trails. Oh the smells!! Ummmmm Ummmmm! And that brought our Big Day to an end. Back to Glen Rose — just in time for dinner!! I hope your days are filled with adventure and plenty of scent trails to follow. Life is good!! The 4th of July is not our favorite holiday around here. It means parades – that’s fun. It means hot dogs and burgers — that’s really fun. It means Happy Birthday to America – that’s nice. But it also means fireworks. And that means LOUD noise and FIRE. And that makes for a very stressful couple of days. We live in a rural area and everybody loves to shoot off fireworks. They start on July the 3rd and go all through the night and then the day of July 4th. I can hear them now as I’m telling you about it! We also live in a VERY DRY area. So sparks from fireworks are a potentially scary thing. I don’t mind the fireworks one way or another, but my buddy Cisco thinks it’s lots of thunder and he gets major stressed. And the Mom Person stays stressed because she worries that our pasture and woods will go up in blazes of glory. So we watch the parade in town and then spend the rest of the time worrying. I hope that you are taking care of your dogs during this stressful holiday and staying safe. I highly recommend a series of CDs made especially for calming dogs. It’s called Through A Dog’s Ear and was created by Lisa Specter and Joshua Leeds. You can find out all about it on their website here.